Anonymous moms, friends, close family-friends and DivaMoms come to me all the time asking for advice on this very touchy particular topic. Here are my thoughts. You have just gone through one of the most emotional, confusing, exhausting and surreal things known to mankind — a divorce. After taking the time to get back on your feet in many ways, you feel you are ready for — can you believe it? — a date! You do not worry about the typical aspects of dating — what to wear, what restaurant to select, topics of conversation — because you are focusing on something far more important — your children. Dating with children is no easy feat, and to make matters more difficult, it seems to get harder the more you begin to like someone! But there are some tips floating around thanks to those who’ve had first-hand experience — some obvious and some not-so-obvious — that are sure to aid you on the journey. This is obvious, but it needs to be said. If your little one is in bed with strep and you have what is sure to be a magical night planned, cancel it. You won’t be able to enjoy yourself knowing that a babysitter is putting your sick child to bed. … you and their father. Do not rush a situation too quickly; you will make both parties feel uncomfortable if it doesn’t feel natural. This is so important. Can you envision a family with the said person? No? Don’t bring him into yours. Your kids will be happy only when you’re at your happiest. That’s just how it works. You don’t want to teach your kids that it’s ever okay to accept a mediocre or miserable life. The same rules truly apply to one who is dating someone who has children — remember that their kids come first, just like yours would if you had them. Don’t get jealous or greedy for his time, and don’t try to play mommy — ever. Don’t take it personally if you’re eager to meet them and you still haven’t. Make sure you encourage and support this man to be the best dad he can be — that will be the ultimate reason he ends up loving you! 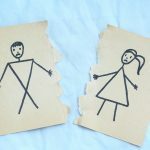 The latest on divorce rates: What splits people apart these days?